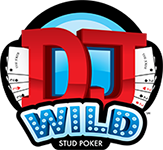 DJ Wild is a new “deuces wild” poker game against the dealer, using a standard 52-card deck plus one additional Joker. The game is pretty simple, where you wager an Ante and equal Blind bet before receiving a five card hand. You then decide to either 2x Play the hand, or fold. The Dealer also receives a five card hand, and always qualifies. The Ante and Play bets receive even money action against the Dealer hand, but the Blind only pays for a straight or better. The Blind pays nice odds for rare hands, but only pays about 6% of your hands. The full analysis of the game shows a house edge of about 3.5% of an Ante. When I first looked at this game, it looked like easy pickings for a table full of colluding advantage players. The confederates would silently share the number of Deuces or Jokers they held in their hands (using simple chip signaling). The whole table would know the number of outstanding Wild cards seen. Each player would 2x Play if they had better than the minimum hand needed for the given Wild count. It looked like the game was toast. So, I quickly coded it all up to find the theoretical 6-way collusion edge. I was shocked to find that even perfect info sharing only yielded +0.5% between 6 players. You’d expect more of an edge on a perfect 2x Play decision and the always-qualifying Ante. Plus, you get the chance to “save” the Blind bet with a weak hand when the Wild count is high. Anyways, I worked out a simple 6-way collusion strategy, just in case it turned out to be slighly +EV. The strategy just uses separate minimum calling hands for each Wild count (0 thru 5). The strategy below only decreases the house edge to 1.1%. Well, at least we know now. No one needs to lose any sleep over this game. Can you explain your HOUSE ADVANTAGE vs ELEMENT OF RISK for 6 play collusion? And what about 2 player collusion? Id like to know the difference there although it seems that it would be really small. So if the true element of risk is 1.02% and we 2 player or 6 player collude, what is the actual risk?